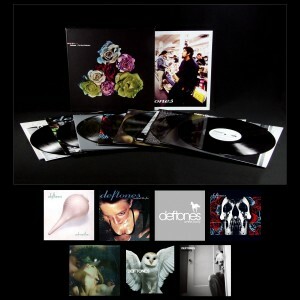 Pre-Order Deftones: The Vinyl Collection, 1995-2011 Today! You are here: Home / News / Pre-Order Deftones: The Vinyl Collection, 1995-2011 Today! Secure your copy of this limited edition vinyl box set, containing the Deftones’ 6 studio albums as well as the limited edition 2011 Record Store Day release Covers. By pre-ordering through the Official Webstore, you will have the opportunity to get your hands on the 1-500 numbered box sets. As an added bonus, 25 randomly picked box sets will be signed by the band. The signed box sets are only available by pre-ordering through the Deftones Official Webstore, so place your order today!